LWM 2016 - AI Netherlands. 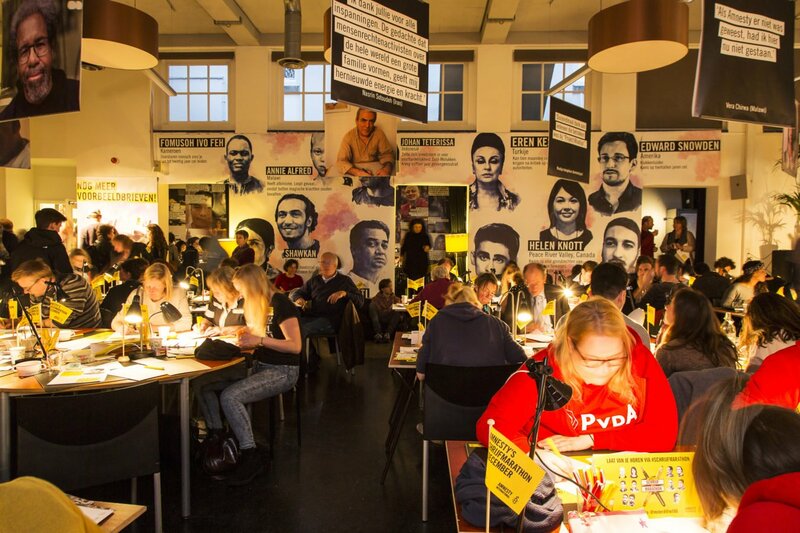 Letter Writing Marathon at the Dutch Office Amnesty International The Netherlands Amsterdam. Every December, to mark International Human Rights Day, hundreds of thousands of people around the globe take part in the world’s largest human rights event: Write for Rights. Here we’ve got all the Write for Rights resources you and your action group need for 2018. For over 15 years Amnesty activists, all around the world, have taken millions of actions to combat injustice during Write for Rights. Check out this video of Australian activists talking about what Write for Rights means to them, and sharing some of their favourite Write for Right moments. Teodora Del Carmen, who was sentenced to 30 years in prison after suffering a stillbirth under El Salvador’s total ban on abortion. She was released in 2018. Download the resources below, and get ready for Write for Rights! Everything you need to know about this year’s Write for Rights is in the toolkit below. We’ve also created solidarity cards and blank letter templates to use for each and every case, a poster featuring success stories, and lanterns to decorate your events with. Ask your ASC or CO for a concertina card to be sent to you from the Action Centre for your event, it lets someone take four actions (so four times the impact) in one go! Each of the nine cases has a poster, case card and petition. Take them to your events and make sure everyone there takes action. The more people we bring on board, the more we pressure authorities to stop abusing human rights! If you want to teach human rights in the classroom, check out the lesson plans below. For more information on our Write for Rights teaching resources, check out our student resources page. Not in an Amnesty action group? If you’re not in an Amnesty action group but want to get involved, sign up here. We’ll send you a toolkit and all the resources you need to help you bring people together to take action. Then, you can get started creating change! Resources are also available in several languages, email your local Action Centre and someone will send them to you!